The ability to store and manipulate dates and times is one of Excel's most powerful features. Using Excel's built-in date and time functions, you can easily add days and months to particular dates; create dynamic date-based fields; and perform complex time-based calculations. However, dates and times in Excel can be a bit difficult to wrap your head around due to the complex way in which the program stores them internally. 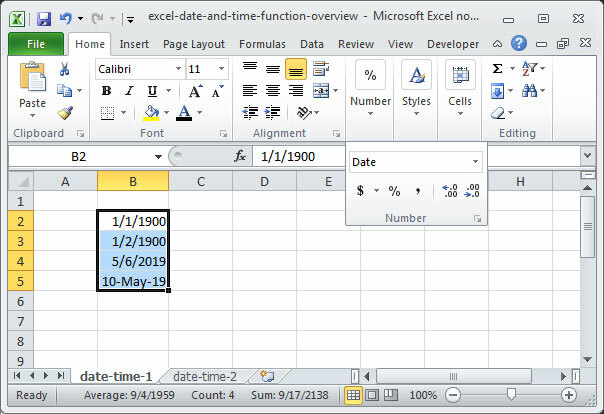 In this tutorial, we'll take a look at the DATE and TIME functions and review how dates are stored as serial numbers in the Excel interface. The most important thing to learn about dates in Excel is that they are not stored as month, day, and year combinations, but rather as encoded serial numbers that represent dates. These serial numbers are easy to interpret — they are simply the number of days that have elapsed since January 1, 1900. In other words, the date January 1, 1900 is actually stored in Excel as the number 1. The date January 2, 1900 is stored as the number 2, because it is two days away from January 1, 1900. And, the date May 6, 2019 is stored as the number 42,129, because it is 42,129 days away from January 1, 1900. As you can see, Excel automatically recognizes our input as dates and formats it appropriately. But, in reality, these dates are being stored as serial numbers that represent each day's distance from January 1, 1900. Note that we've used two different date formats above: 5/6/2019 and 10-May-2019. Excel is smart enough to recognize both of these inputs as dates and convert them to serial numbers automatically. This will even work if you enter more longform date formats into a cell — like May 10, 2019. OK, so we know that dates are stored in Excel as serial numbers. And we know that Excel is smart enough to recognize cell inputs that look like dates and convert them to serial numbers automatically. But is there a way to generate a date's serial number formulaically? Of course there is — the DATE function! This function takes a series of numbers representing months, days, and years as inputs, and converts the specified day into a serial number. In the above example, the formula outputs 1/1/1900, or serial number 1, because the serial number for January 1, 1900 is 1. In the above example, the formula outputs 5/6/2019, or serial number 42,129, because the serial number for May 6, 2019 is 42,129. Now that we've got a handle on dates, how should we think about storing time values in Excel? Fortunately, things here are a lot easier now that we've mastered the DATE function. For the purposes of serialization, each day entered into Excel starts at 12:00am. So a date-time combination entered as 5/6/2019 8:00 would serialize as 42,129.333..., because 8:00 is eight hours past midnight, or 1/3 (.333... or 0.41666... * 8) of the day. Note that a time value entered without a date will serialize without a leading integer — in other words, on January 1, 1900. Try entering a time, like 3:00, into a cell, and then converting the output into a date to observe this phenomenon. Full time values are entered in the format, HH:MM:SS, where HH represents hours, MM represents minutes, and SS represents seconds. They can either be entered in 12-hour format or 24-hour format, so 3:00:00 PM and 15:00:00 are both valid and mean the same thing. Like the DATE function, the TIME function is used to convert a series of numbers — representing hours, minutes, and seconds — into a serialized time. Above, the formula outputs 12:00 AM, or serial number 0, because that time is 0 hours, 0 minutes, and 0 seconds after midnight. Above, the formula outputs 5:23:36 AM, or serial number 0.2247222..., because that time is 5 hours, 23 minutes, and 36 seconds after midnight. Those are the basics of DATE and TIME used in Excel formulas! If you have questions or comments on the above, sound off in the comments section below. Otherwise, read on to learn about more handy Excel functions that handle dates and times.